Every vegetable you will eat from this place the rest of this season hangs in the balance – right now. Everything Dela and I do – right now – to remove weeds, apply compost and straw, water and monitor thousands of plants across 6 acres – determines volume and quality of nearly half a year’s fresh produce. With wooden plough handles extending from my arms, I work a razor-sharp blade about a foot wide, balanced behind a miniature bike tire. Forward and back, I rock the apparatus across the soil. This adaptation of the centuries’ old wheel hoe is an organic grower’s weapon of mass weed destruction. Ten steps forward, nudging the blade gently along the edge of Maxibelle bush beans. Ten steps backward – harder and faster, across the path’s center. Ten steps gently forward again, oscillating back and forth along heirloom radishes and squash that form the path’s other side. It takes 3 sweeps to clear a walking path of weeds. Bare roots of tens of thousands of weeds and grasses eventually lie across the turned soil in the oscillating wheel hoe’s wake. In a single morning, a section of them lie composting in the warm air and brilliant June sunshine. Each half day I work the wheel hoe, six more clean lines of vegetables extend 100 to 140 feet. With each section I clear, more rows of vegetables stand up clearly ‘mid the fallen weeds. I could clear more rows in a day, yet weeding is not the only chore that must be done. Back down the rows of seeded crops, I unravel drip tape recycled from last year’s production. We’ll use this to irrigate during drought. Then I apply thousands of chips of straw bales from a flat rack wagon I filled last fall, or from others I made from oats, wheat, millet, prairie grass and stored in our barn’s loft. I carpet straw over new weeds to suppress more from rising. It saves us having to weed over and over through a season. When there is no one to help us, weeds eventually overwhelm many beds. When there’s harvesting, prepping and delivering vegetables; hay to cut and bale; small grains to harvest; fall crops to sow; weeds seize the advantage, destroying months of work. Most days, as I reach a row’s end with the wheel hoe, I turn to see Dela at the field’s opposite side. Wherever she is, she’s weeding, too. Focused, steady, spiritual, she is body and soul a part of each seed and seedling she’s nurtured to life. We are a field apart, dividing and attempting to accomplish the scores of tasks required daily to feed scores of households. We are so different and yet so uniquely given physically, seasonally to all it takes to extend patterns of protection across so many, many yards of crop varieties rising in our charge. We’re watering plants now with drip tape irrigation and sprinklers, section by section of garden and field. Storms we looked expectantly for the past 8 days blew past us in strong winds from every direction. Our tools, arms, hearts break the dry crusts of soil to help tiny plants, tender transplants keep rising up from germination. There’s just enough moisture to keep growth going. Intimately, lovingly, there’s more than enough vibrancy in all of life to sustain us, to sustain you. Please, please, if you can, turn to someone in your place of work, invite a friend or neighbor, to join us in this community of support for organic agriculture. We have not reached a number of supporters yet to meet a year’s production expenses. 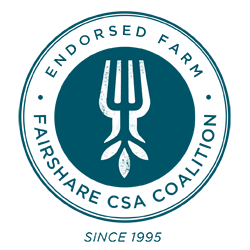 Recruiting members and endorsing our farm are as important as coming here to volunteer. It will help right now, a whole season’s successful growth.